1. Put the mince in a large bowl. Add 1 tsp gochujang paste, ½ the garlic and ½ the ginger, plus the coriander stalks and 2 tbsp water. 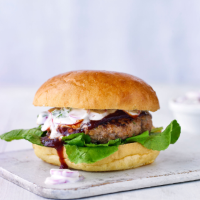 Season, mix well with your hands and shape into 4 rounds; flatten to make 1cm-thick burgers. Chill on a plate until ready to cook. 2. Combine the yogurt, mayo and remaining garlic and ginger. Stir in the radishes and coriander leaves to make a slaw; season and set aside. Mix the remaining 2 tbsp gochujang with the ketchup.